Purplebricks blamed a “challenging” UK housing market and “headwinds” for its Australian business. UK boss Lee Wainwright is leaving for “personal reasons”. No reason was given for the departure of Eric Eckardt, the chief executive of the US business. 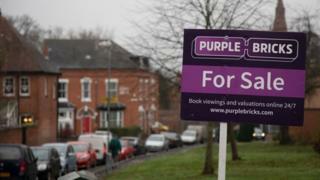 Shares in Purplebricks dropped sharply on the news, falling as much as 40% before recovering. The company has been expanding rapidly, but has also seen losses grow as well. In today’s statement Mr Bruce said the company was in a good position to take advantage of growth potential in the UK, US and Australia, but added “albeit not entirely as we would have wanted before our year end”.